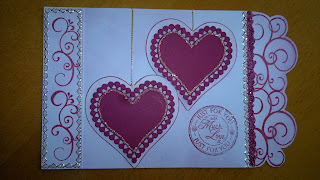 On this card I used Tim Holtz Milled lavendar Distress Ink around the card edge and stamped hearts in the back ground. The top edge of the card is accentuated by Berry Fizz glitter. I finished it with some peeloffs and Stickles.